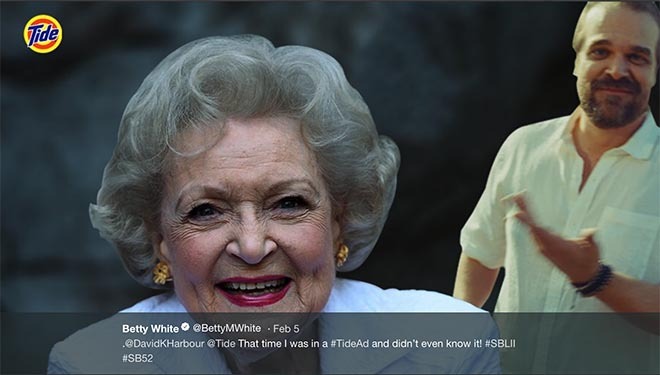 David Harbour, known for his role as Chief Jim Hopper in the Netflix drama series Stranger Things, provides cameo after cameo in Procter & Gamble Super Bowl commercial “It’s A Tide Ad”. 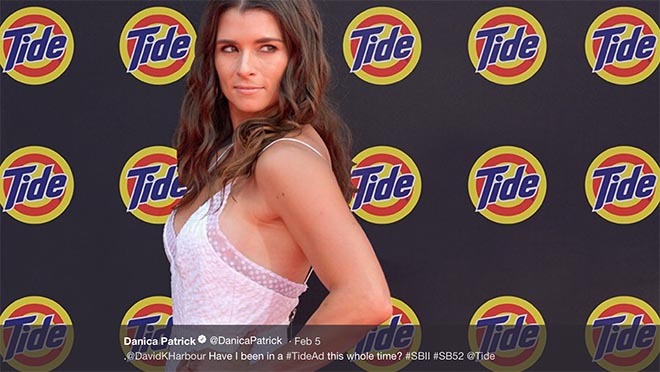 Aired during the NFL Super Bowl LII 2018, the Tide Ad series has David Harbour claiming that every time you see clean clothes in a Super Bowl commercial, it’s a Tide ad. The TV and movie star takes viewers on a journey spanning a wide variety of advertising clichés selling cars, insurance, perfume, pain relief, Coca Cola and beer. How do these seemingly random ads relate to Tide? Well, it’s simple. If you see clean clothes, it’s a Tide ad. David Harbour playing tennis? Tide ad. David Harbour as an insurance adjuster? Nope. Tide ad. 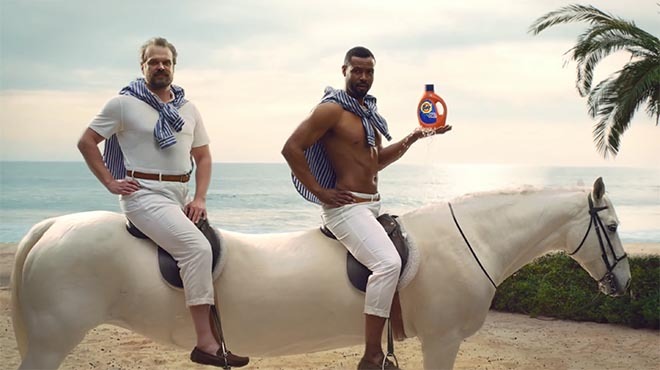 David Harbour sitting on the back of a Lithuanian Long horse, flanked by Old Spice pitchman Isaiah Mustafa? Tide ad. How about David Harbour mopping the floor in all white, dressed like Mr. Clean from the 2017 Super Bowl? Yes, even that is a Tide ad. By now you get it. Whenever you see clean clothes, it’s a Tide ad. 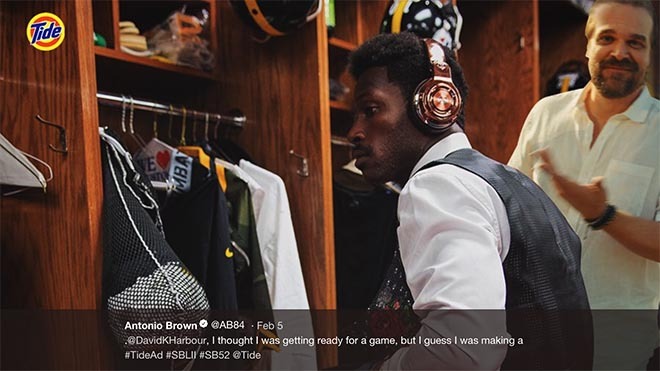 Social media elements to the campaign included Twitter cameos by Betty White, Pittsburgh @Steelers All-Pro WR Antonio Brown, Danica Patrick, last year’s Tide Super Bowl presenter Terry Bradshaw, and Old Spice presenter Isaiah Mustafa. The It’s A Tide Ad campaign was developed at Saatchi & Saatchi New York by chief executive officer Andrea Diquez, chief creative officer Javier Campopiano, executive creative director Paul Bichler, creative directors Daniel Lobaton and Chad Baker, associate creative directors Max McKeon, Rafael Segri, Frederico Mattoso, art directors Jacopo Biorcio and Erin Evon, senior art director Maddy Kramer, copywriter Blake Morris, director of integrated production Jenny Read, executive producer Dani Stoller, director of business affairs Robin Oksenhendler, senior business affairs manager Lisa Rimmer, strategy director Nayantara Mukherji, digital director Alan Lin, strategist Corina Arnal, regional account director Nick Miaritis, account director Ryan Martin, senior account supervisor Jennifer Brotman, account supervisor Guillermo Betancourt, ecommerce account manager Jed Karnowski, account executive Jennifer McGill and assistant account executive Courteney Case, working with Procter & Gamble North America Fabric Care Sundar Raman, brand director North America Fabric Care Delivery Vedran Miletic, BBIC Kimberly Doebereiner, advertising production manager Paul Chick, brand manager Jennifer Maxwell, assistant brand manager Alex Perez, and brand communications manager Matthew Wormington. Filming was shot by film production collective Traktor via Rattling Stick with director of photography Hoyte Van Hoytema, executive producers Joe Biggins, Jeff Shupe, Richard Ulfvengren, head of production Richard McIntosh, producer Rachel Curl, production supervisor Chloe Stella. Editor was Jeff Ferruzzo at Arcade Edit with producer Andrew Cravotta. Colourist was Tom Poole at Company 3. Visual effects were produced at The Mill by creative director Becky Porter, 2D lead artist Narbeh Mardirossian, 3D lead artist Tom Grahm, 2D artists Ashley Forbito, Lisa Ryan, Jake Maymudes, Mandy Sorenson, Chris Hunsberger, Stefan Smith, Jason Bergman, Gareth Parr, Sam Evenson, 3D artists Charles Storniolo, Jason Kim, Sharlene Lin, matte painter Ed Laag, motion graphics team Greg Park and Kyle Romaneck. Sound was mixed by Philip Loeb at Heard City. Music was produced at Personal Music by composer Alexis Estiz with producer Courtney Jenkins.